A very important manuscript copy of Ptolemy's so-called 'Handy Tables' is MS Vaticanus Graecus 1291. This page is restricted to some details of the famous Helios miniature, and why it is of interest for the Voynich MS, but a brief general description of the MS and the Handy Tables in general may not fail (1). Ptolemy's 'Handy Tables' (Procheiroi Kanones) are a revised and extended version of the astronomical tables in his 'Almagest'. Ptolemy designed this set of tables for practical use (especially among astrologers). He only wrote a short introduction giving intructions for using the tables, but he said nothing about the theory underlying them, even though in a few instances he had modified the theory since writing the almagest. Among the additions to the tables are a chronological table (know as the Kanon Basileion or 'Ptolemy's regnal canon') and a geographical table (the list of 'noteworthy cities', poleis episemoi) extracted from his Geography. Ptolemy's handy tables achieved a more widespread distribution in antiquity than the Almagest. In late antiquity many commentaries were written on them. 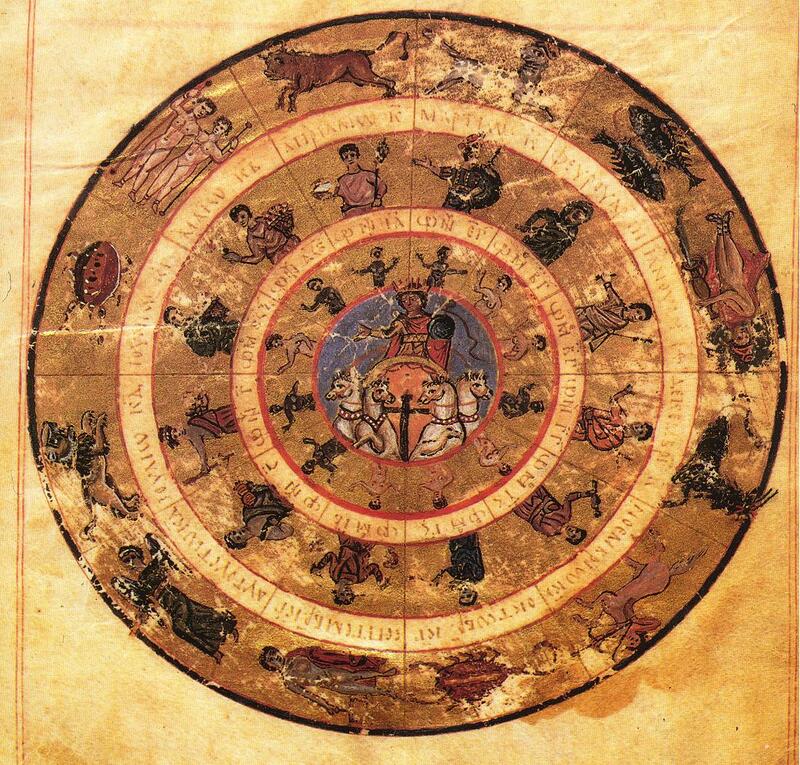 These were mostly limited to explanations of how to use the tables, but an exception is the so-called 'Great Commentary' by Theon of Alexandria (late 4th Century AD), which attempts to explain the relationship between the Almagest and the Handy Tables. Vat. gr. 1291 is the oldest and most beautiful MS copy of the tables that has been preserved. It dates from AD 813-820 (reign of Pope Leo V). Other MS copies of the same age are Leidensis gr. 78 (88?) and Laurent. XXVIII, 26. There is no reliable edition of the MS, but the Helios miniature has been described in various publications (3). This miniature is found on fol. 9r, and it is assumed to be the original start of the MS. It is of circular design, with a central emblem figuring Helios in his chariot. There are several circles surrounding this emblem and all are subdivided into twelve segments. The inner circle has twelve small naked female figures, six light- and six dark-skinned. Outside that are twelve numbers in Greek (henceforth called 'labels'). Outside that twelve clothed male figures representing the twelve months. Outside that are written the month names in Greek (indicating a specific date in the month) and on the very outside of the figure one may see the emblems of the zodiac signs. 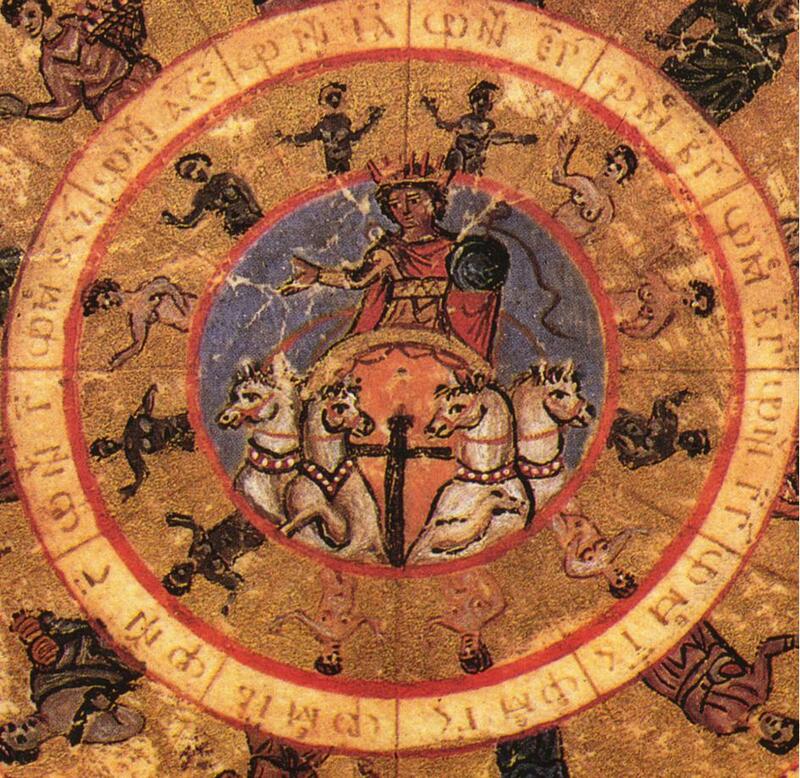 The labels written near the nymphs define the date and time in which the Sun enters the zodiac sign depicted in the outermost ring. Boll (1899) calculates from these labels that they are valid for the 3rd Century, but Neugebauer quotes a publication (van der Waerden, 1954) indicating that he was wrong, and that it should be 9th century instead. Since Neugebauer quotes that Boll's calculations are wrong, but does not specify in which manner, the above values must be taken with care. Further articles about this dating are Spatharakis (1978) and Wright (1985). Unfortunately, I have not seen any of these. While these illustrations were made with completely different tools and techniques from those in the Voynich MS, they are quite similar with the latter's nymphs due to their size, appeance and arrangement. This is all the more interesting since such illustrations are very unusual in medieval MS (4). Instead, their style belongs to late classical times (as used in statues). Could the writer of the Voynich MS have been inspired by this very MS?. N. Halma: Commentaire de Théon d'Alexandrie sur le livre III de l'Almageste de Ptolemée; Tables manuelles des mouvements des astres. Paris, 1822. Tables manuelles astronomiques de Ptolemée et de Théon. II and III. Paris, 1823-1825. Nolhac: Bibliothèque de l'école des hautes études, 74. fasc. : La Bibliothèque de Fulvio Orsini, Paris, 1887, pp. 168-169. Boll, F.: Beitraege zur Ueberlieferungsgeschichte der griechischen Astrologie und Astronomie; Sitzungsberischt der philosophische und historische Classe, vol. I, 1899, pp. 111-138. Van der Waerden, B.L. : Bemerkungen zu den 'Handlichen Tafeln' des Ptolemaios. Sitzungsber. Bayer. Akad. Wiss. Math. Naturwiss. Kl., 1953, 261-272. Van der Waerden, B.L. : Ein Byzantinischer Sonnentafel, Sitz. Bayer. Akad. der Wiss., Math.-Nat. Kl. Naturwiss. Kl., 1954, pp. 159-168. Stahlman, W.D: The Astronomical Tables of Codex Vaticanus graecus 1291. Doctoral dissertation, Brown University, 1960. To be published by Garland (date unknown). Neugebauer, O.: A History of Ancient Mathematical Astronomy. 3 vols. Berlin, 1975, vol.2, pp. 969-979. Spatharakis, I: Some observations on the Ptolemy Ms. Vat.Gr.1291: Its date and the two Initial Miniatures, Byzantinische Zeitschrift, vol.71, 1978, pp.41-49. Tihon, A.: Le "Petit Commentaire" de Théon d'Alexandrie aux Tables Faciles de Ptolemée (Bibliotheca Apostolica Vaticana, Città del Vaticano, 1978. (Studi e Testi 282). Wright, H.D. : The Date of the Vatican Illuminated Handy Tables of Ptolemy and its early additions, Byzantinische Zeitschrift, vol. 78, 1985, pp. 355-362 [on Spatharakis' paper]. Tihon, A. and J. Mogenet: Le "Grand Commentaire" de Théon d'Alexandrie aux Tables Faciles de Ptolemée, Livre I (Bibliotheca Apostolica Vaticana, Città del Vaticano, 1985. (Studi e Testi 315). Tihon, A.: Les Tables Faciles de Ptolemée dans les manuscrits en onciale (IX-X siècles), Revue d'Histoire des Textes, vol.22, 1992, pp.47-87. Tihon, A.: Le "Grand Commentaire" de Théon d'Alexandrie aux Tables Faciles de Ptolemée, Livres II et III (Bibliotheca Apostolica Vaticana, Città del Vaticano, 1991. (Studi e Testi 340). Mostly from Neugebauer (1975). (Bibliography included above, on this page). The bibliophile Fulvio Orsini lived from 1512-1600. His collection was entered into the Vatican Library. Apart from Neugebauer I am also using Boll. I have not seen the others. I am indebted to Giancarlo Truffa and Rob van Gent for most entries in the list of references.